Yesterday, a report surfaced that claimed directors Robert Zemeckis and Matthew Vaughn were the two front runners to direct The Flash movie, while another report revealed that another pair of directors passed on the project, Sam Raimi and Marc Webb. As of now, it remains unclear when a final decision will be made, but this morning, it seems another director expressed interest in the directorial gig, Kevin Smith. DC Films and Warner Bros. haven't asked the director to consider the job, it isn't even known if the studio would be interested in the filmmaker taking on this superhero adventure, but it may be worth considering. The Flash has already lost two directors already, with Seth Grahame-Smith parting ways with the project that would have ultimately marked his directorial debut. Rick Famuyiwa (Dope), came aboard to replace him in June, but he ended walking away due to creative differences in October. 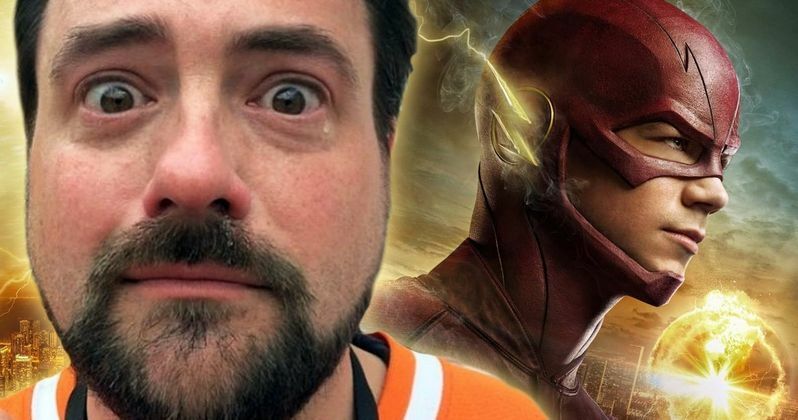 Earlier today, Kevin Smith responded on Twitter to a news article about Sam Raimi passing on The Flash movie, hinting that he would not turn the job if it was offered to him. Here's what he had to say below on social media. "I know of at least one Director who wouldn't pass. (But to be fair, he's more of a "director" than a Director...)"
Oddly enough, Kevin Smith himself revealed during a November podcast that he would love to see original Deadpool director Tim Miller take the reins of The Flash movie, but that was before a report that Tim Miller was teaming up with James Cameron for a Terminator reboot. Based on the studio's current front runners, Robert Zemeckis and Matthew Vaughn, it seems clear that the studio is opting for filmmakers with much more experience than the first two directors attached to The Flash, which is another reason why Kevin Smith could be a good fit. Ironically, his work directing two episodes of The Flash TV series may actually be a detriment to the filmmaker working on the movie, since Warner Bros. has made it clear that the movie universe is completely different from the TV universe. Still, The Flash movie star Ezra Miller hinted in an interview last year that he "can't wait to see him," referring to The Flash TV show star Grant Gustin, "adrift in the Speed Force." The actor would not clarify his statement, but we do know that the movie is getting a full page-one rewrite from Joby Harold (King Arthur: The Legend of the Sword), but nothing is known about what new direction this story may be heading in. The production has also hit another setback, with the news that Billy Crudup has walked away from the movie, months after signing on to play Barry Allen's father. Ezra Miller is still set to play Barry Allen, with Kiersey Clemons playing Iris West and Ray Fisher returning as Cyborg. If the studio chooses a director soon, it isn't known when production will begin, but hopefully we'll have some more concrete details on The Flash very soon.